The author of Vicksburg, 1863 proves himself once again to be an expressive literary chronicler of the American Civil War. 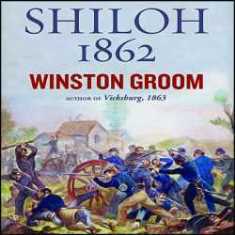 His subject this time is the Battle of Shiloh (or Shiloh Creek, as it’s also known), which took place near Pittsburgh Landing, Tennessee, in early April 1862, the beginning of the second year of the four-year conflict that has also been called The War Between the States. Each of the seventeen chapters has a descriptive title on the Contents Page. Beginning with April Is the Cruelest Month, these include: From Failure to Fortune; He looked Like an Old Viking King; All the Furies of Hell Broke Loose; My God, My God, It Is Too Late! ; and An Exalted Distinction. Groom writes that Union Army General Ulysses S. Grant underestimated the Confederate forces, and General Beauregard prematurely reported via telegram to Jefferson Davis in Richmond, a “Complete Victory of Confederate arms that day.” To an imaginative reader, some of the letter writers quoted in Shiloh, 1862 might evolve into characters. In early May of this year, Groom gave a presentation at a Montgomery benefit for The First White House of the Confederacy. The schedule for the festive evening included a reception and book signing. The author’s energetic imagination and enthusiasm for the historic subject he has researched and analyzed were evident in his presentation and are present throughout his 400-plus-page narrative. Julia Oliver is the author of four books of fiction, including Devotion, a novel based on the life of Jefferson Davis’ celebrity daughter Varina Anne (“Winnie”) Davis.